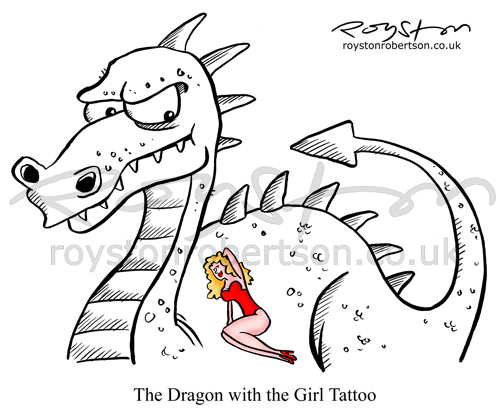 You may have seen quite a few cartoons around which play on Stieg Larsson's The Girl with the Dragon Tattoo. Cartoonists often riff off each other's ideas to come up with new jokes, and certain themes take hold. This cartoon can be seen in the October issue of Reader's Digest. If you saw my Ramsgate Arts festival talk last month, you'll have got a sneak preview of this. You lucky people. I knew someone would get there before me. Submitted exactly the same gag to the Eye last week. Bit slow on the uptake, old Aaron. Ha, no worries, it found a happy home anyway. Excellent! Really like the artwork on this one Royston - that dragon's face is wonderfully leery.